Björkö is an island in Korsholm municipality , Finland. It is situated in the Kvarken area of the Gulf of Bothnia. The chief settlement is called Björköby. 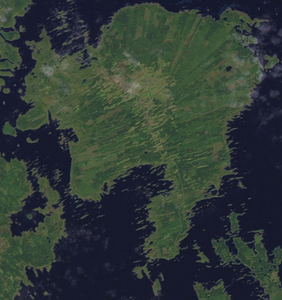 In addition to the main island, the Björkö area includes 350 skerries and its total area is 72 km2. In 1973, the Björköby municipality merged to Korsholm. During the Swedish reign over Finland, the island was notable for being a post transport base in the archipelago on the Finnish side. Mail was ferried by the inhabitants of Björkö to the islands of Holmöarna, Sweden. They got reductions in taxes and exemption from military service for this service.